One of our favorite things to do with clients is spice up their morning commute. How much more exciting would your work day be if you arrived via helicopter? Come on, what a way to impress! While the idea might seem a little “out there” or too crazy to incorporate into your morning routine, at Independent Helicopters we make the whole experience very professional and relaxed. 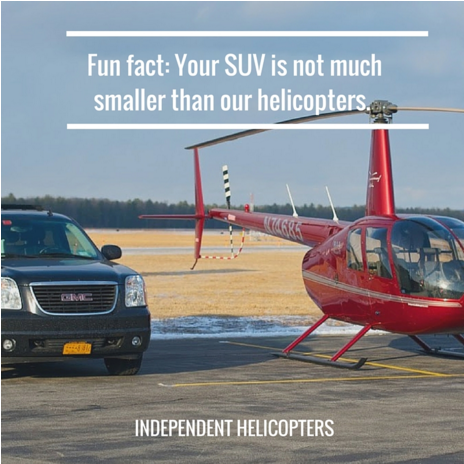 Did you know that our average helicopter size isn’t even that much bigger than your standard SUV? While the experience is definitely unique to say the least, it’s not as outlandish as you might think. In fact, to us, it’s normal! Give us a call today to see how your day could be improved with a charter flight.